When Jordan Lake was filled in 1982, hundreds of bathers were attracted to a beautiful stretch of beach along the shoreline of Weaver Creek, accessible by foot path from Pea Ridge Rd. This became known as Glass Beach not because of broken beer bottles but because the water surface was so smooth. Today, there could well be a different connotation of Glass Beach. 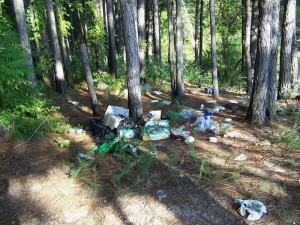 Amidst the trees that have grown up along the shoreline are beer bottles, cans, six pack containers, beer cases, whisky bottles, plastic bags, blue plastic bait containers and even dirty diapers. Nearer to the shore around a campfire circle are broken bottles. Shards of glass are strewn along the beach. Incredibly, there are even dirty diapers being left within inches of shoreline. In several cleanup efforts led by Clean Jordan Lake over the last couple of years, over 120 bags of trash have been removed, yet littering of Glass Beach continues unabated. 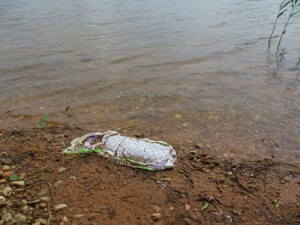 The latest effort to curb littering is Clean Jordan Lake’s Adopt-A-Shoreline Program. Glass Beach was adopted by the Weaver Creek Homeowners Association. This group collected 25 bags of trash in their first cleanup in March of this year, only to find the site heavily littered again in just one month. Not only has littering continued, but the Adopt-A-Shoreline sign was completely destroyed by vandals on the weekend of May 12. Clean Jordan Lake and the U.S. Army Corps of Engineers (USACE) have teamed up to try a different approach to stop the trashing of Glass Beach. An informational sign has just been installed (May 23) on the path leading down to Glass Beach that explains why litter is harmful to natural habitats and to water quality. Comparing photos of a littered Glass Beach that we have taken to that wonderful image of bathers enjoying the same spot in summer of 1982 is a graphic reminder of how the careless actions of a few can destroy a beautiful public place. To see dirty diapers in the mix puts an exclamation point on the need for stricter enforcement of ant- litter laws to preserve not only aesthetics and natural habitats, but possibly to prevent spread of water borne disease. Despite seemingly slow change in attitudes about litter, Clean Jordan Lake and USACE remain committed to tackling the problem through various activities such as environmental education of primary school children in USACE’s Junior Ranger program and community service projects for various groups as well as the general public throughout the year that are sponsored by Clean Jordan Lake.